The Natty Boh man atop Natty Boh Towers. Baltimore is a city known for its breweries and is not afraid to show it – driving into the city on Route 95, travelers are sure to see the mustachioed Natty Boh man winking at them from the top of Natty Boh Tower. National Bohemian beer, for which the Natty Boh man was named, was first brewed in Baltimore by the National Brewing Company in 1885. Baltimore’s love affair with sudsy brews goes as far back as the mid-eighteenth century. The first brewery began operation in Baltimore in 1748; since that time, over 115 breweries have operated in the city (Arnett et al. 1999:274). In 1983, the newly-formed Baltimore Center for Urban Archaeology conducted an excavation at the site of the former Clagett’s Brewery, at the corner of President and Lombard Streets. Thomas Peters opened the Baltimore Strong Beer Brewery in 1784, locating his operation along Jones Falls to take advantage of the water available for brewing the ales and beers, for carrying away brewery waste products and for constructing a wharf for export of his products. The brewery operated under as many as ten owners (including Eli Clagett) until 1880, when the property was sold to the Maryland Burial Case Company (Akerson 1990). Two of the malting tiles found at the Clagett’s Brewery site. The tile on the left shows the malting floor surface side, while the tile on the right shows the underside, with the deep cell structure. Figure 1. Perfume bottle molded in the shape of a wicker covered demijohn. Bottle dates c. 1845-1865. This tiny and incredibly fragile perfume bottle, discovered in a Baltimore privy during the 1980 excavation at the future site of the Federal Reserve Bank, was made by the Boston & Sandwich Glass Company of Sandwich, Massachusetts (Boston and Sandwich 2017). The company operated between the years 1826 and 1888, producing blown and pressed glass containers (Barlow and Kaiser 1998). Measuring only three inches tall, this bottle was molded in the shape of a much larger bottle called a carboy or demijohn. These bottles, ranging in size from 5 to 16 gallons and used to transport bulk liquids like vinegar or acid, were covered in woven wicker to prevent breakage. This little cologne bottle, with its wicker molded surface, dates between circa 1845 and 1865. Figure 2. Bathing before the advent of running water and plumbing involved hauling and heating large quantities of water. In Victorian America, personal cleanliness was viewed as a symbol of upstanding character and self-respect. In America’s crowded cities, it was also an important public health matter. Wearing perfume or toilet water could certainly help cover body odor, but there was much to be said for bathing as a way to improve personal sanitation and health. Before the days of running water and plumbing, many people kept clean through what we would call today a “sponge bath”, using basins of water or small hip baths. In 1893, only 7.35% of the families in Baltimore lived in a house with an indoor bathroom. Fortunately for the rest of Baltimore’s citizens, public bathing facilities were soon to be a part of the city’s amenities. Figure 1. Dessicated cork from Oxon Hill Manor (18PR175). Photo courtesy MAC Lab. Figure 1. A 12 pound solid shot found during dredging in the Patapsco River near Fort McHenry. Resting for many years deep in the silt at the bottom of the Patapsco River, adjacent to Baltimore’s Fort McHenry, this 12 pound cannonball’s underwater fate belies its brief moment of glory. For this cannonball was fired during the momentous battle that led to the genesis of our country’s national anthem. We all know the story from our elementary school days. Francis Scott Key, a Maryland-born lawyer, was inspired by the sight of the U. S. flag that flew over Fort McHenry during the September 1814 Battle of Baltimore. Although British shells rained down relentlessly for 25 hours, the fort held (Lineberry 2007). Key, watching the battle throughout the night from about eight miles away, was relieved to see in “the dawn’s early light” the American flag flying above the fort – a sign of American victory. Later that morning, Key penned a poem he entitled “The Defence of Fort McHenry.” Within a month, it had been published in at least nineteen American newspapers (NMAH 2016). Key himself set the poem to music, using a popular English melody written around 1775 and entitled “To Anacreon in Heaven”. The first documented public performance of Key’s work set to music occurred on October 19, 1814 at the Holiday Street Theater in Baltimore (SI 2016). The song was later retitled “The Star Spangled Banner”. Although it was a popular patriotic song throughout the nineteenth century, “The Star Spangled Banner” did not become our country’s national anthem until 1931. Figure 2. A View of the Bombardment of Fort McHenry. Print by J. Bower, Philadelphia, 1816. https://en.wikipedia.org/wiki/Fort McHenry. 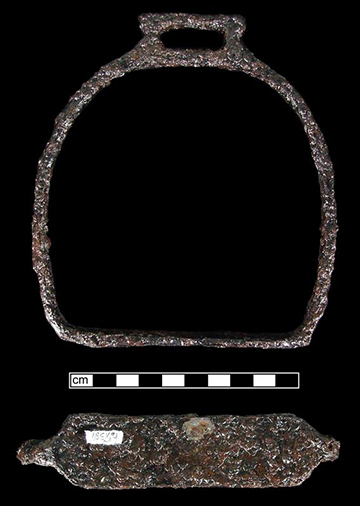 Iron stirrup recovered from the stable (1711-1730 context) at the Smith St. Leonard site (18CV91). May and June bring the Triple Crown of Thoroughbred Racing—the Kentucky Derby, the Preakness Stakes, and the Belmont Stakes—and Maryland is proud to claim the Preakness as its own. Horse racing has a long and storied history in Maryland and this stirrup from the Smith St. Leonard Site (18CV91), a 1711-1754 tobacco plantation in Calvert County, is representative of the state’s long history with horses. This site contains remains of the only known eighteenth-century stable (c. 1711-1730) in Maryland, from which this stirrup was recovered. Estate details from the inventory, taken at the time of plantation owner Richard Smith Jr.’s death in 1715, reveal that he was breeding horses for sale. The value of the individual horses however indicates they were work, rather than racing, animals (Cohen, personal communication 2010).